The RPR-903PS pulse isolation relay provides three isolated solid state Form C (K, Y, & Z) contacts from a field-selectable Form A or C inputs. The RPR-903PS’ input supplies its own sense voltage to the pulse sending unit(s), usually an electric meter’s pulse initiator. The RPR-903PS has two fixed Form C outputs. In addition, the third output features two field-selectable modes, Normal mode or Pulse Doubling mode. In the Pulse Doubling mode the output provides a true Form C to Form A pulse value conversion. 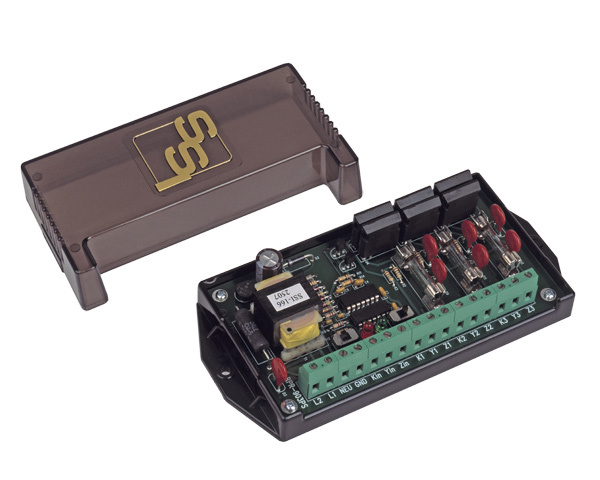 The RPR-903PS relay is designed to filter noise and transients from its input to prevent any false pulses at its output. Bright red and green LED indicators display the system’s status at all times thus allowing a rapid visual check of the system’s performance without requiring any additional test equipment. 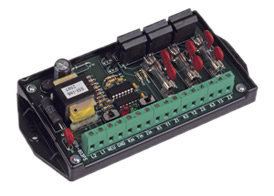 The RPR-903PS’ input and output circuit’s terminal strip connector is a “Euro” type, providing excellent insulation from live electrical contacts. Each “K” lead of the RPR-903PS’ outputs is fused to prevent damage to the relay under almost any condition a user might cause such as excessive current, incorrect wiring, etc. The RPR-903PS’ robust solid state switching device is rated at 800V at 750mA giving maximum protection from lightning or transient voltage damage. Its built-in transient protection for the solid state switch contacts eliminates the need for external or off-board transient suppression devices. All component parts that have power applied to them, with the exception of the input/output terminal strip are enclosed in a polycarbonate cover for maximum protection. The mounting base plate is also made of polycarbonate and offers excellent electrical insulation between the circuit and the mounting surface.